Dear Ella: We received your postcard and you did a terrific job on the drawing of the building. SOPA Studios is an artist collective – a group of artists who get together to exhibit our artwork and some of us also teach art workshops. SOPA stands for SOuth PAsadena. We have about 20 members and we create art in all kinds of media: oil and acrylic paint, pen, ink, graphite, collage, and encaustic. If you want to see some of our artwork, go to http://www.SOPAStudios.com. We have just redone our website, so not all of our members’ work is uploaded yet. This is an exciting project and we are happy that you chose our “Hope Street”! 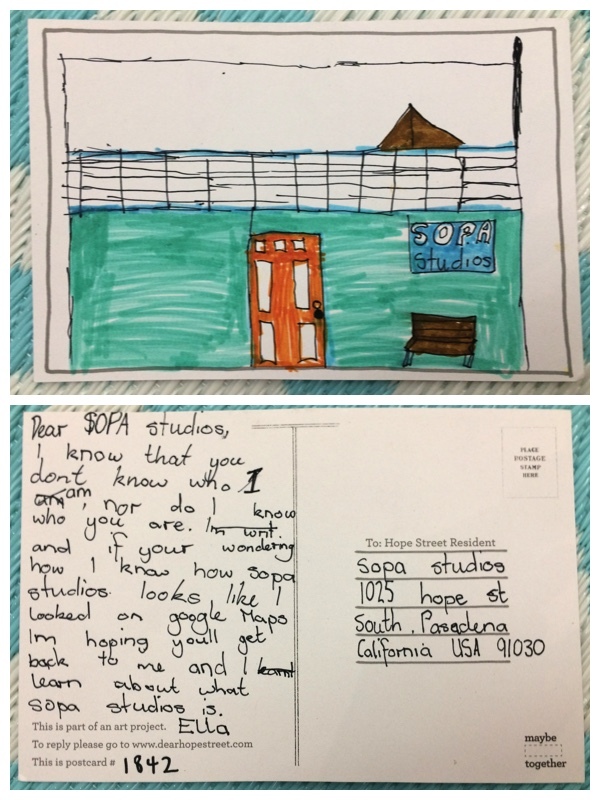 Best wishes, All the Artists at SOPA Studios.